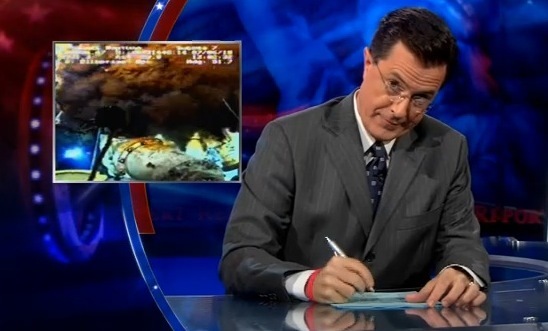 Right, it has been almost 3 months since the DeepWater Horizon blew on April 20th. I now recognize that that date will go down in history. It’s undeniably horrific the point we’re at now. But it’s impossible to keep up with that level of anger and outrage, eventually it turns to cynicism and a numb sort of acceptance. I think it’s time that we shake off this sense of defeatism. How? Through humor. After all, it was only the court jester who could laugh at the king. That kind of insight is invaluable. Humor provides perspective, an ability to seeing ourselves and our views outside of our normal, critical awareness. Humor can also be a way to work through resistance (internal or external) or barriers of opposing view points and to communicate with an emotional depth otherwise too risky for seriousness. Grist’s Ask Umbra wrote an excellent response to a writer wondering how, with the oil spill in the Gulf, anything she did at home could possibly make a difference in the grand scheme of things, noting that it seems ridiculous to worry about using paper towels or plastic bags in the face of this level of environmental devastation. Why even bother? What can the little things we do matter at this point? Fact is, it is only our actions that will make the difference. We can’t wait for politicians or industries to tell us to make changes. We can’t just sit and stew in our own misery and self-riteous anger. It’s about time we dug our selves out of this funk we’ve sunk in to and do the only things we can. Lead through example. In the mean time, we should take a moment to laugh at the politicians and executives who’ve left us hanging. They can’t stand that. Let’s show them how it’s done. Where to look for relevant environmental comedy? The Daily Show rarely fails to deliver, and the Colbert Report has been surprisingly entertaining on the subject matter as well. Any number of comedy acts depend almost exclusively on current events for inspiration. You won’t have to look far to stumble across something that fits your tastes. 2007 saw Seattle’s Environmental Comedy Festival at the Comedy Underground. The event was designed to raise awareness in environmental issues and non-profits. In fact, Comedy Underground does weekly Non-Profit Comedy fundraising events for a variety of worthy non-profits, including the Sightline Institute, the Neighborhood Farmers Market Alliance, the Duwamish River Cleanup Coalition, and the Environmental Coalition of South Seattle (ECOSS) all in 2009 alone. Of course I know that no amount of joking around will provide easy answers to such wicked problems, and I don’t think that avoidance through entertainment is a solution. But I do think a little bit of comedic perspective would do everyone a world of good at this point.